Thank you to all alumni and friends of Holy Cross for contributing to The 426 Scholarship Program! Your efforts directly fund the scholarships listed below. *Learn more about these opportunities by clicking on the scholarship. Keep those reading skills sharp by reading everyday! The English Department has selected some intriguing novels to be read this summer. Don't forget, this year's reading assignments will be included in the course. Pay $200 in the Business Office to register for the course. CLICK HERE for more information. When do we use math at Holy Cross? Everyday! This summer Holy Cross Students will work on math skills selected by the Math Department to get them ready for "calculated" success in their math course next year. Pay $200 in the Business Office to register for the course. CLICK HERE fore more information. Get an edge on the competition and prepare for your PSAT/SAT. Contact the school for the schedule of classes. Pay $250 in the Business Office to register for the course. Learn how to build, program, and operate robots! Join us on educational and fun field trips. Sessions will be 8 am - 12 pm Mon - Fri. Pay $250 in the Business Office to register. Join our middle school and high school summer league! Games are on Thursdays at 6 pm for high school and 6:30 pm for middle school at Astro SuperBowl. 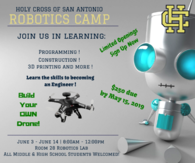 Contact Ms. Calderon at molly.calderon@holycross-sa.org to register. Don't know how to play the guitar? Would you like some extra practice? Join our guitar camp for tutoring and lessons 8 am - 12 pm. Pay $50 in the Business Office to register. We invite boys and girls to be a part of the athletic program and prove that you are ready to “play like a champion today”. Practices will be at 6:45 am - 8:15 am Monday - Thursday. Pay $125 for youth and high school athletes in the Business Office to register. Learn how to play the drums in preparation for the Holy Cross Drum line! Lessons are 8 am - 12 pm. Pay $50 in the Business Office to register. 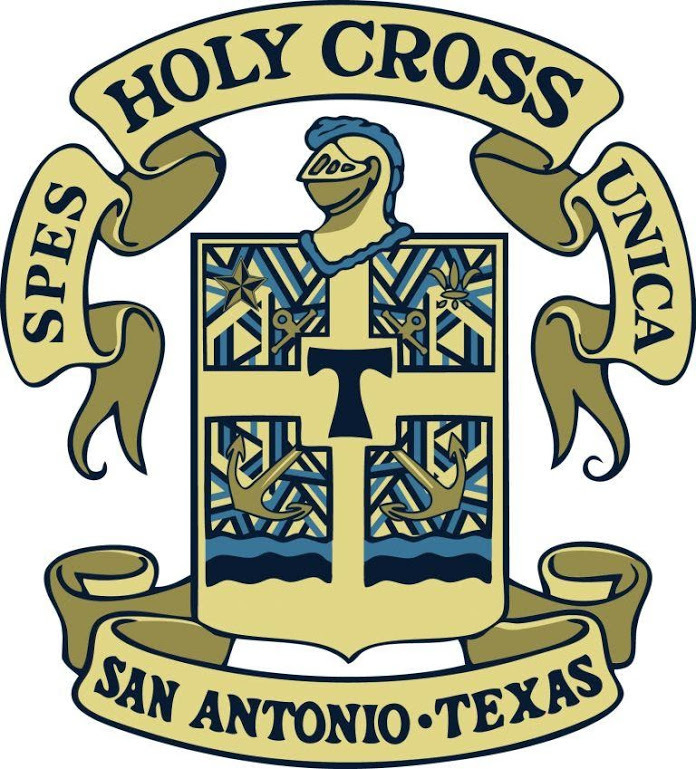 We are looking for dynamic educators who understand the Mission of Holy Cross of San Antonio. If you believe that you have what it takes to be a teacher at our school please email Dr. Escobedo, our principal and Mr. Vasquez, our Academic Dean your cover letter and resume. Only those who apply through the archdiocesan website will be considered. The positions will be filled as soon as possible so do not hesitate in emailing your information. Why 426 N. San Felipe St. ? WHY 426 N. SAN FELIPE ST? In the mid 1950’s the Archdiocese of San Antonio conducted a fundraising campaign. The goal was to open four high schools for boys. There would be one in each sector of the city: north, south, east and west. It was anticipated that each of these schools would open in 1957. They would be archdiocesan schools but they would be administered by different religious communities. The school planned for the west sector was to be a trade school. (1) Prior to the school opening the religious community originally contacted to administer the trade school indicated that they would not be able to do so. The Archdiocese of San Antonio then contacted the Brothers of Holy Cross. The Brothers of Holy Cross appreciated the invitation but informed the Archdiocese that they conduct only college preparatory high schools. The Archdiocese agreed to accept the change to a college prep high school. As negotiations continued the Archdiocese described the educational conditions and the social demographics of the neighborhood where the west side school would be located. The Provincial of the Brothers of Holy Cross responded immediately, “We will take it.” (2) The Westside High School was then named Holy Cross High School. Since the fundraising campaign was not as successful as was hoped, only two schools were constructed. On September 3, 1957, 84 young men entered the ninth grade at Holy Cross High School. 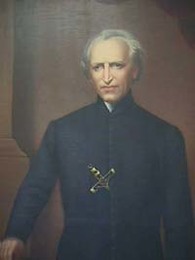 The faculty consisted of three Holy Cross Brothers and a chaplain. Each year another section was added to reach the four year complement. On June 4, 1961 forty-six young men received their diplomas. Today, they proudly identify themselves as “the pioneers.” And rightly so! Each year more than 90% of the graduates enroll in college. 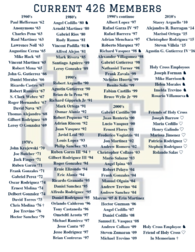 In the Class of 2010 there were 81 graduates. Eighty had college acceptance by the day of graduation and the one remaining was entering the U. S. Air Force. Holy Cross graduates are accepted to colleges and universities throughout the United States. Two have received Gates Millennium Scholarships and are currently attending Stanford and Notre Dame. 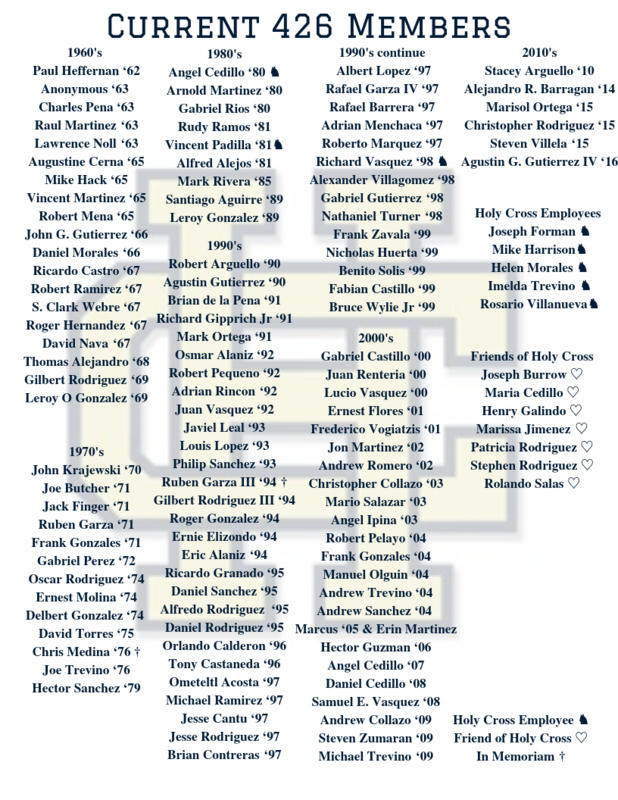 There are almost 4000 alumni. Alumni are making their community contributions as judges, physicians, attorneys, professors; in the trades, in managerial positions; in the military; as entrepreneurs; as engineers; as law enforcement personnel and fire fighters; in the arts; and so forth. 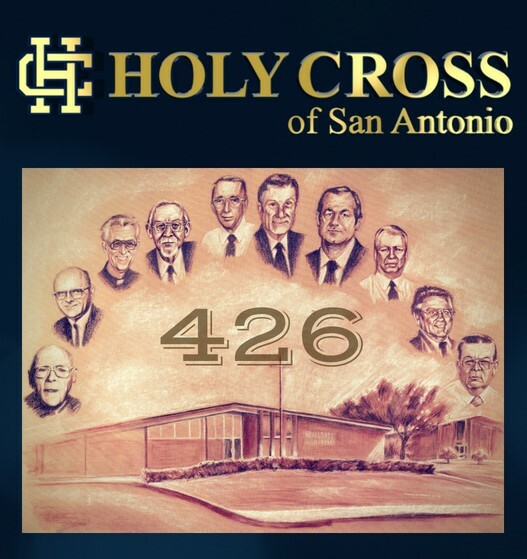 Through the years Holy Cross High School has responded to pressing educational needs primarily in San Antonio’s Westside and Southside. 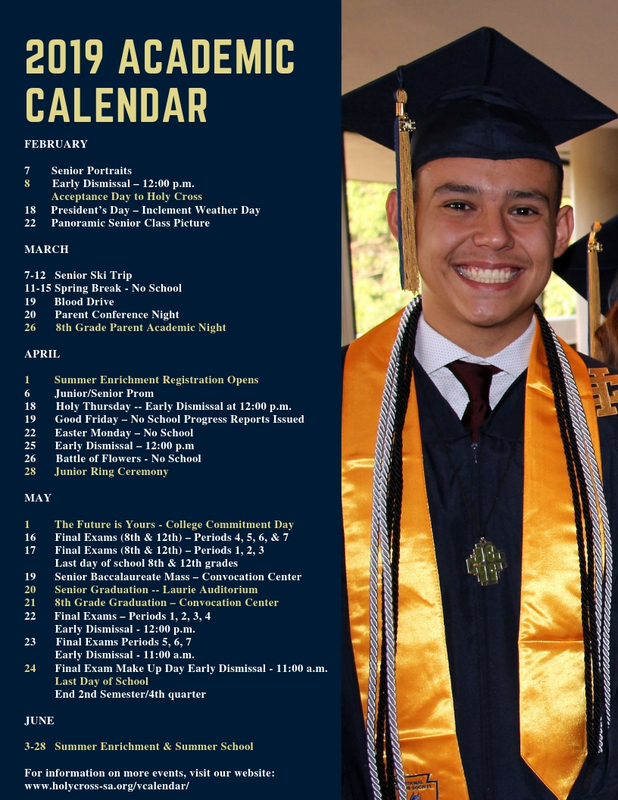 It is San Antonio’s only private Catholic, coeducational, college preparatory middle and high school. 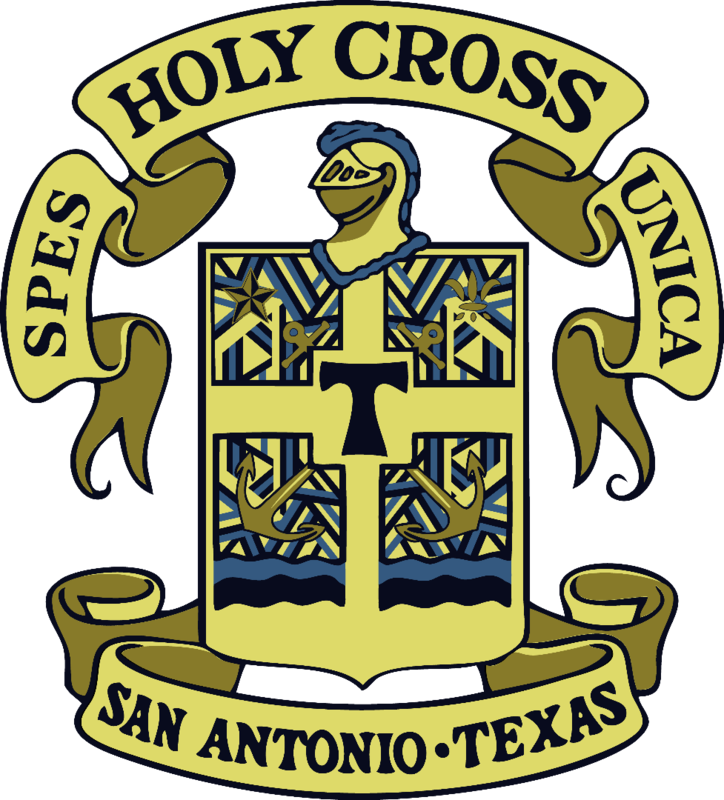 To give recognition to the expanded student body, the name has been changed to Holy Cross of San Antonio. In Part One, it was pointed out that Henry Ford broke with traditional manufacturing and introduced the assembly line. The end product was important. He was successful because he was able to mass produce an automobile that was affordable. McDonald’s and Burger King chose the proper locations and are successful. Holy Cross is successful, maybe more successful than any of the above. Since 1957 Holy Cross has made a Catholic, value centered college preparatory education available. The alumni are educated. They are contributing members of society. They are distinguished citizens. Maybe by traditional perspectives their neighborhoods are not recognized as the source of so many outstanding citizens. Students, parents, alumni and faculty are most grateful to Father James Dujarié and Father Basile Moreau for developing religious who can identify where real gems are located. Yes, I agree with the principle of “location, location, location.” The Holy Cross “product” proves that 426 N. San Felipe Street is the perfect location! This is the version that I heard since I first arrived in 1958. Brother Ephrem (Provincial) signed the contract with the Archdiocese of San Antonio in 1955. When he visited in 1968 he told me his response.